Koko the gorilla was found dead Tuesday. The Gorilla Foundation released a statement that the lowland gorilla, who mastered sign language, died in her sleep. Koko had a vocabulary of about 2000 words and communicated with humans. 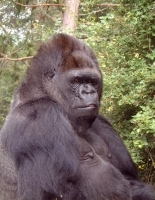 Researcher and one of Koko’s keepers, Francine Patterson, had hoped that Koko would mate and have children. She wondered if Koko had offspring would she teach them sign language? But unfortunately, Koko never mated and never had children. She was friends with Robin Williams and Fred Rogers. Researcher Francine Patterson said that Koko was quiet and very thoughtful when told of the death of Robin Williams. Koko also met Flea, the bassist in the Red Hot Chill Peppers, and the actor Betty White. Koko was very fond of cats and had her own “pet” kittens throughout her life.